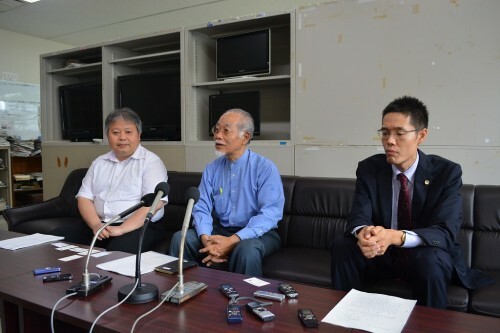 Lawyer Tsutomu Arakaki (center) and other committee members filed a written opinion claiming that it is possible to cancel the landfill approval. At the Press Club in the Okinawa Prefectural Government Office on the morning of May 1. The Review Committee which is investigating the possibility of cancelling the approval for the construction of a new U.S. Military Base consists of lawyers and administrative law experts in Okinawa. On May 1, the committee members visited the Okinawa Prefectural Government Office. They filed a written opinion claiming that it is possible to cancel the approval for the landfill application at Henoko, Nago (where a replacement for U.S. Futenma Air Station is being built) granted by former Okinawa Governor, Hirokazu Nakaima. As well as the written opinion, the committee members filed documents on countermeasures which the Okinawa Prefectural Government could take if the Japanese government challenged the cancellation.